KUMBA BWAH fled from Liberia in 1996 during one of Africa’s bloodiest civil wars. They say over 200,000 were killed and millions of others ran for their lives. Today, as a result of this brutal war Kumba finds herself alone, without her children, in the Buduburam Refugee Camp in Ghana. Her only hope is to one day find her children and be reunited with them. 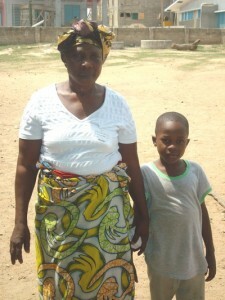 Just recently she was told her son has been found in Loffa County, Liberia! Kumba is praying daily that she can find the means to return home. She will need 200 USD and 100 USD for her Grandson Eric. If you are able to help her resettle, please contact us. You can email karen@provisionofhope.com or phone 250-454-9456. Please read her story, as it was told to Bernice Williams one of Provison of Hope Leaders for the Single Mothers Empowerment Program. “On April 6 1996 there was a heavy war that was fought in Liberia, which made me and my family flee from our home. While we were escaping, from the war, my oldest son was killed in front of me. I began to cry. While I was crying one of the rebels told me to shut up. I could not shut up, so he took his cutlass and attacked me. My leg began to bleed. The rebel started beating me with his gun. In the process the government soldiers attacked the place where we were. This was how all the rebels ran away and my family and I began to run for our lives too. I was limping and dragging my bleeding leg. When we walked a long way and got very tired we reached to some bush area and slept there. We started our journey the next day. We walked till we reached the Guinea border. At the border there was a heavy rocket launch that made many lose their lives. After that, I could not see my husband and children. They were all missing! I ran into the bush for two weeks searching desperately for my family. I was like a mad woman! My leg was still bleeding so I took my blouse and tied it on my leg to stop the bleeding. I was in so much pain and so frustrated. The rebels later attacked the Guinea side. I heard a firing sound while I was in search for my children. I really did not want to move, I only wanted to find my children. I never feared about gun shot any more if it could kill me, only I feared not finding my children. I later met a lady in the bush. She was running away from gun fire, she saw me and stopped to ask me what I am doing there. I told her I am in search of my missing children. She felt for me and wept with me. She said we should run and leave that place because when rebels see us they will kill us. She encouraged me and we started to run to the border side, passing among the gun shots that were flying around us. With God’s help we were able to cross the border to reach Guinea. While in Guinea I had sleepless nights worrying about my children. I searched in Guinea for my children but I could not find them. Some of the refugees in Guinea told me to go to Ghana maybe I could find my children there, since refugees fled there too. They put together transportation this is how I was able to get to Ghana. I searched for them in Ghana but I still could not find them. I am believing that God will locate my children to me one day. I later started planting potatoes and carrying them to the market for sale to make my living. Presently I am suffering from high blood pressure due to the worry of my children. May Father God greatly undertake for Kumba Bwah and mothers like her!!! I’m sending $ to help. Thank you Laurel. I called Kumba to wish her a Happy Mother’s Day, and told her the wonderful news, that we now had the funds to transport her home!! She was overwhelmed with joy!! She could not stop thanking God for His goodness!!!! I am so happy for her.